This morning you will be personally met at your hotel by a DISCOVER AUSTRALIA representative and transferred from your hotel to the cruise liner terminal. 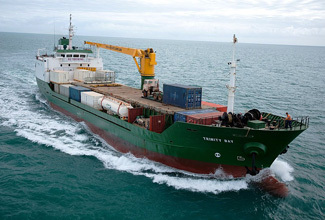 Board the MV Trinity Bay Cargo Ship and begin your 6 Day Cape York return cruise. Enjoy the authentic experience of life on a real working cargo ship while taking in the most remarkable sights of the very northern tip of beautiful tropical Australia. Make use of the ship’s modern onboard facilities and your private ensuite cabin. Enjoy the dining facilities, licensed bar, outside deck areas, media room with movie collection, books & board games. Passenger areas are comfortable and air-conditioned. All meals are buffet style, enjoy onboard snacks and coffee, tea and biscuits. 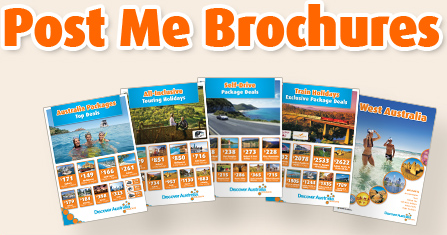 Optional tours are available on Horn Island, Thursday Island and Bamaga. The Trinity Bay is the only working cargo vessel in Australia that also carries passengers, with a total of 48 berths over 15 cabins. Since this is primarily a working cargo vessel operating in remote waters, passengers are required to be independently mobile, have general good health where any medical conditions are controlled and be mentally capable. This is a truly unique cruising experience through some of the world’s most awe-inspiring tropical waters. Unwind and relax as you watch the world go by, travelling up the Cape York Peninsula. Enjoy the expansive ocean views from the open-air relaxation and viewing decks. You will have plenty of choice with all meals onboard being buffet style, as well as snacks and free coffee, tea and biscuits. The ship offers comfortable indoor areas for you to relax through out your journey, with air-conditioned Dining/Lounge room, licenced bar and a DVD & Reading room. This morning you could explore the natural beauty and hidden stories of Horn Island. When in port and transshipping you'll get an in depth understanding of how crucial this service is to the communities of island and coastal northern Australia. Your Horn Island optional tour offers the opportunity learn about the Islands’ rich history and role as an important strategic air base in WWII, once home to over 5000 troops. Visiting warplane relics, an underground command post, an old gold mine commissioned in the 1860's and many scenic spots from which to admire the views. An archaeological excavation in recent years at King's Point on Horn Island unearthed a 34th Australian Heavy Anti-Aircraft Battery station. Restored and recreated in recent years, the site includes the remains of the gun turrets and the central command post. At the Heritage Museum you will hear the stories of the men and women who served here and view a varied display of pearl diving memorabilia and Torres Strait art. With the largest collection of Torres Strait artifacts in Torres Strait, the Museum provides a personal side to history of the area including the traditional owners of Horn Island, the Kaurareg People. Following your tour and museum visit, a sumptuous buffet lunch of Asian, Torres Strait and seafood dishes await you. Feel free to enjoy more time in the museum after your lunch, or browse the souvenirs. Disembarking on Thursday Island you may choose to take in the island culture on a popular bus tour. Visit interesting historical sites, enjoy stunning panoramic island views and explore the vivid and interesting displays of Thursday Island’s hilltop museum. Green Hill Fort has abandoned bunkers and tunnels, some of which are home to the historical museum. This unique and fascinating Museum holds rare artifacts from the rugged past of the Torres Straits, including displays from the pearling era, traditional relics from the Torres Strait Islands. Enjoy a scenic drive around the island complimented by your guide’s signature lively and informative commentary, passing the Islands Churches, some over 100 years old, and Lions Lookout with its magnificent sweeping vista¹s of the surrounding Islands and waters. You then have free time to browse through the local shops to find an unusual keepsake. Arriving into Seisia, may choose to venture to the northern most point of mainland Australia, the Tip of Cape York. Travel in the air conditioned comfort, as you drive along dirt road into the remote wilderness. Escorted by an experienced guide, you will learn about the local history and culture, diverse flora and fauna of the Cape, as well as its unique birdlife. Now that you’ve made it to the end of the road, you may celebrate your achievements with something from the huge range of souvenirs at the Croc Tent. Offering exclusive Cape York clothing products, and over 500 souvenir products including Cape York stubby coolers, signs and toys. If embarking on the full day tour, you will also visit Somerset and enjoy a picnic lunch whilst you hear about the areas interesting history. Alternatively, explore the areas of Seisia and Bamaga at your own pace before returning to your vessel. Reminisce on your tropical island adventures and exploring the largest unspoiled wilderness in northern Australia and one of the last remaining wilderness areas on Earth. After arriving back to Cairns you will be personally met at the cruise terminal by a DISCOVER AUSTRALIA representative and transferred to your hotel. Time to say goodbye to beautiful Cairns, your fellow travellers and friendly hotel hosts. You will be personally met at your hotel by a DISCOVER AUSTRALIA representative and transferred to the airport to meet your flight home. Relax in your private ensuite cabin on board the MV Trinity Bay while you sail the Great Barrier Reef and enjoy FREE buffet style cuisine, biscuits, tea and coffee. Make use of the ships on board facilities such as an Indoor and Outdoor viewing decks, lounge room, bar and reading room. Your package includes private ensuite twin cabin with porthole for you to watch the Great Barrier Reef passing by. You will be personally met by a DISCOVER AUSTRALIA representative and transferred from the airport to your hotel, from your hotel to the cruise liner terminal, from the cruise liner terminal to your hotel and from your hotel to the airport for your flight home. The MV Trinity Bay is one of the few remaining passenger carrying cargo vessels in the world and offers its passengers an authentic experience of life on a real working cargo ship while taking in the spectacular sights of a remote area of Australia. The MV Trinity Bay is the only privately owned cargo ship in Australia to also carry passengers and is capable of carrying up to 48 passengers - since the service commenced, it has carried more than 24,000 passengers! Travel with MV Trinity Bay and visit a remarkable area of the world - the Torres Strait area is an often overlooked but is a truley amazing region. This cruise has won multiple awards and is said to be one of the best bucket list trips available today. A camaraderie will soon strike up between the like-minded, independent travellers who are all on board for this unique adventure. If you want to unwind and put your feet up watching the world go by, travelling up and down the Cape York Peninsula from Cairns to the Torres Straits is the journey for you. From the ship's deck you can see passing vessels, rugged coast, islands, lighthouses and even whales when in season. Each night, weather permitting, view the stars and pick out a number of constellations. When in port, you'll get an indepth understanding of how crucial this service is to the communities of remote northern Australia and have the choice to participate in tours on Horn Island, Thursday Island and Seisia. Live the stories you'd love to tell on this remarkable cruising experience! The 6 Day Cape York Cargo Cruise Return Stay is very popular. Many dates book out well in advance, please book soon.